This entry was posted on Monday, November 7th, 2011 at 20:55 and is filed under Barack Obama, Breaking News, European Union, Foreign Policy, Idiotic Politicians, Politics. This is perfect. It’s precisely what you’d expect from this president whose policies have demonstrated an enmity toward Israel, but toward Netanyahu particularly. It’s disgusting. Sarkozy has been a questionable character all along, and now Obama complains that he has to deal with Netanyahu daily. Of course, given the way Netanyahu educated Obama at a joint press conference earlier this year, I suppose I can understand why Obama can’t stand him. Netanyahu schooled Obama, unflinchingly. 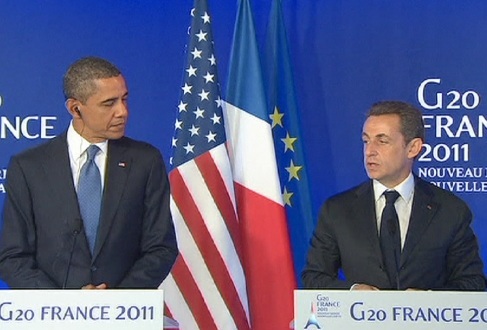 Didn't Obama just diss Sarkozy to his face a few days ago (what happened to that story – disappeared off the intenet?). Now they're united against a common enemy. Two chumps who aren't worthy to lick Bibi's boots. Of course they hate Israel, so why wouldn't they hate their leader! If Obama and Sarkozy have their way, they will have the Islamic version of the Ottoman Empire rebuilt on America's dime. Netanyahu is more American than Obama will ever be, and more loved by both parties that Obama could even fathom. This did more to hurt him than anything else. Too bad they won't release the sound bite…. "Netanyahu is more American than Obama will ever be" – quote of the day! Too bad we can't trade the not-a-muslim for Bibi. "Of course they hate Israel, so why wouldn’t they hate their leader! If Obama and Sarkozy have their way, they will have the Islamic version of the Ottoman Empire rebuilt on America’s dime"
Really? Jewish apartheid? Are you joking? I hope you got all of your hate out of your system with these two posts, because they'll be your last on this site. Of course this shouldn't come as a surprise to anyone who's followed Obama's dealings with the Israelis. He has so much disdain for the Jewish state and its people. The real surprise for many is many Jewish-Americans continue to put with and support this president, who clearly doesn't have any affinity for them. was this really news? i thought everyone hated bibi. No, not everyone has irrational hatred of Netanyahu. Apparently, it's more common than I had thought in leftist circles.